OVERVIEW: With an unmanned, half-mile-long freight train barreling toward a city, all hope rides on the shoulders of two courageous men to prevent a catastrophe. UNSTOPPABLE is a high-intensity, action-packed thriller coming to Blu-ray and DVD from Twentieth Century Fox Home Entertainment on February 15th. SYNOPSIS: Inspired by actual events, “Unstoppable” is an adrenaline rush fueled by director Tony Scott’s signature mark of propulsive action rooted in the reality of ordinary people placed in extraordinary circumstances. A veteran train engineer (Denzel Washington) and a young conductor (Chris Pine) race the clock to stop an unmanned runaway train – effectively a missile the size of a skyscraper -- and prevent disaster in a heavily populated area. FILM REVIEW: The tagline says it all . . . “1 million tons of steel. 100,000 lives at stake. 100 minutes to impact.” Who better to tell this story than the Denzel Washington/Tony Scott combo? Throw in a little Chris Pine, a little Rosario Dawson, and others and you’ve got an intense, thrilling nail biter. So how do you stop an unmanned, runaway, speeding train? This no nonsense movie takes you on that ride and it is fun, fast, and powerful. One of the many interesting aspects of this film is the insider’s look at the world of train transportation. It gives it to you from a totally different perspective. The cinematography used to present this perspective is top notch, not only from the various angles of the trains but also with the beautiful city, small town, and countryside shots as we roam across the State of Pennsylvania. After all, we are talking about Tony Scott. As far as current movie makers are concerned, he has a unique style that is visually stunning as well as suspenseful. When you have movies like Days of Thunder, The Last Boy Scout, True Romance, Enemy of the State, Man on Fire, Domino, Déjà vu, and The Taking of Pelham 1 2 3 under your belt, you can’t help but to have high expectations for whatever work that director does. Well, once again, he does not disappoint. I wouldn’t say it’s his best work, but it is very good nonetheless. The same can be said about Denzel’s performance; not his best but still good. In other Tony Scott movies, Denzel’s performance and character keep pace with the intensity of the story and in some moments IT IS the intensity of the story, i.e. Man on Fire (one of my favorite movies of all time, in my opinion Tony’s best work and one of Denzel’s best performances). In this one however, Denzel is drowned out by the intensity of the story. In other words, the focus of this film is more on the story than on Denzel’s character or performance. Chris Pine also falls into that category. He does a good job but it is shadowed by the story. The attachment to the characters by the viewers is not as strong in this movie compared to some of Tony’s other movies. The viewer is more into whether or not this train is going to get stopped. Speaking of the train, I got a kick out of the train’s number, 777. In this case, the number 7 is not very lucky. At only a little over an hour and a half, this movie is about as fast paced as the train itself. That’s probably why character development is not so strong. Actually, the script in this movie is not so strong either. There really isn’t a whole lot of over the top or overly inspiring dialogue. Again, the true star of this show is the 777 train. The movie is still edge of your seat entertaining, though, no doubt. 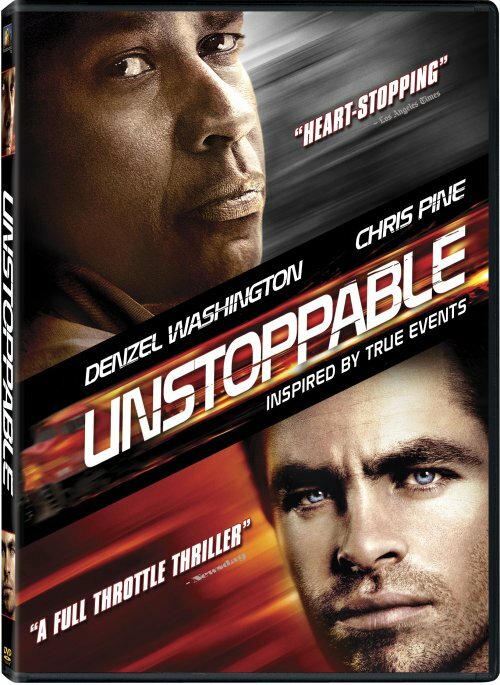 DVD: Unstoppable is presented in a widescreen format with a 1.85:1 aspect ration. The transfer looks clean, judging from the watermark screening received it is very difficult to determine the real quality of the video, however I wont doubt that the final product will be just fine. The picture is complemented with a 5.1 Dolby digital sound in English, French and Spanish with Spanish, French and English subtitles. In the field of special features DVD includes a director's commentary track an a interesting featurette called "Tracking the Story: Unstoppable Script Development".If you want to deep inside the making of the film you should go to the Blu-ray of the version.